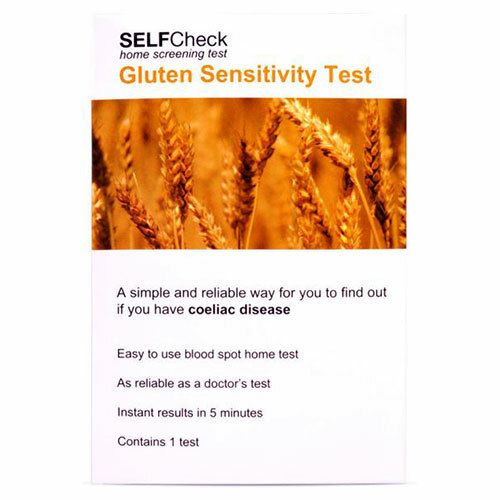 This Coeliac screening test is a home test intended to aid the detection of IgA antibodies to transglutaminase associated with Coelaic disease but the final diagnosis must be confirmed by a doctor. Coeliac Disease can be diagnosed by relatively simple diagnostic tests. The test requires a simple finger prick blood sample (10ul) and a visual result is available within 10 minutes indicating the presence/absence of IgA autoantibodies against Transglutamisase enzyme associated with Coeliac disease (4). The test has been patented (5). Coeliac disease is a lifelong genetically inherited gastrointestinal disorder that can cause a wide spectrum of clinical symptoms ranging from mild weakness, bone pain, constipation, chronic diarrhoea, abdominal bloating, and progressive weight loss. Also skin disorders and disorders of the central nervous system can exist and damage to the inner surface of the small intestine is caused by a permanent intolerance to gluten (1). Gluten is the most common name for specific proteins found in all forms of wheat, rye and barley that are harmful to persons with coeliac disease. Collect a sample of blood from your fingertip, dilute in the buffer solution and drop the test strip in the buffer solution mix. If the result is positive: The test indicates that there is Coeliac disease associated IgA antibodies in the tested blood. Detection of these antibodies indicates a high probability of an existing Coeliac disease. For the final diagnosis and possible treatment, contact your doctor for advice. Do not start a gluten-free diet without consulting your doctor first. If the test result is negative: The test indicates that there is no coeliac disease associated IgA antibodies in the tested blood. An existing coeliac disease can virtually be ruled out. If gastrointestinal complaints are present, further medical investigation is necessary. Also, if you have been following a gluten-free diet, the level of IgA autoantibodies will decrease and may become undetectable a few weeks after the change in diet, or at least in the six months thereafter. Therefore you can have a negative result if you are following the gluten-free diet. This is also a way to monitor the effects of the gluten-free diet. In addition, in the case of a few rare medical cases, such as IgA deficiency, the test may render a false negative result. If the test is contrary to your expectations, consult your doctor. Always read the enclosed instruction leaflet carefully before use. Keep out of reach of children. Do not use the test after expiry date. Use the test only once. Store between 4°C and 30°C. For external use only. After use, discard the test components with your household waste. There is no danger from the components, providing you use them in accordance with the instructions. Consult your doctor in case of positive result and before making any medical decisions. In-vitro diagnostic kit for self testing. If you find your purchase is unwanted or unsatisfactory, we are happy to exchange items or refund your credit/debit card , provided the goods are returned to us within 28 days of their receipt. Please note the goods should be in the original undamaged packaging and in a re-saleable condition. We will only accept goods that are unopened (with any seals and shrink-wrap intact). 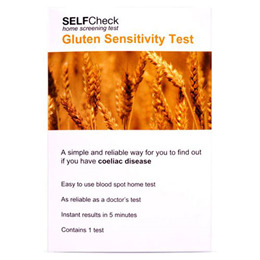 Below are reviews of SELFCheck Coeliac (Gluten Sensitivity) Test Kit - 1 Test by bodykind customers. If you have tried this product we'd love to hear what you think so please leave a review.